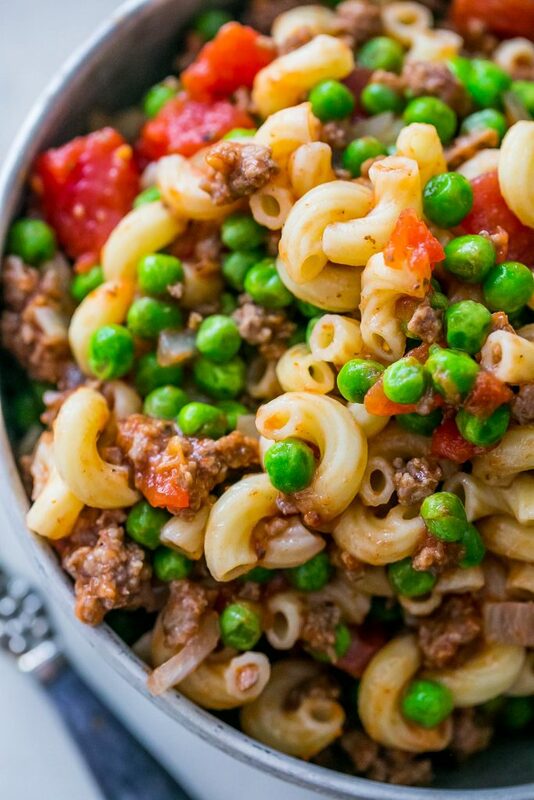 Our family favorite Grandpa’s Irish Stew (as Macaroni Goulash) is full of meaty tomato and pasta flavor with peas and onions for a quick and easy hearty dish! We’ve always called it “Irish Stew” – even though it is NOT Irish. 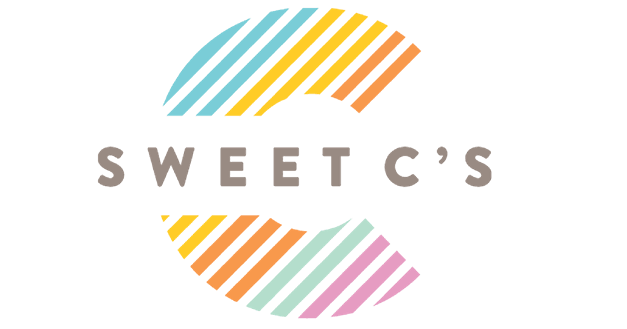 Or even a stew (it’s more a pasta salad) – but the story behind the name is cute, I promise. I don’t often tell personal stories on my site since most everyone wants to just get to the recipe, but I think this one is too sweet to pass up. JUST TAKE ME TO THE HAMBURGER GOULASH MACARONI SALAD RECIPE ALREADY! If you’d rather skip my (very helpful, i think) tips and tricks, essential cooking info, and similar recipe ideas – and get straight to this deliciously easy Irish Stew recipe – simply scroll to the bottom of the page where you can find the printable recipe card. My husband’s grandpa Ken was one of the sweetest people I had ever met. He had the warmest smile and a booming but gentle voice that you’d hear nonstop. He’d regale anybody he met with colorfully sweet stories, memories, and would become instant best friends with anybody he met. He travelled the world both in his service in WWII and working for the Boy Scouts as well as building fisheries for the Department of the Interior, and loved learning about people and their stories. He also really, really loved his favorite recipes- especially anything his beloved Barbara would make. My husband recently was flipping through his family cookbook, and one recipe stood out to him as one of Grandpa Ken’s favorites – his family’s Irish Stew recipe. He remembers him helping make this dish (he usually left cooking to his “sweetie” as he’d always call her- as even well into his 80’s he would be working around the farm, climbing on the roof to fix something, or some other odd job) and that he loved it a lot. When my mother in law saw we were making it she dove right in for a bowl from memory lane! Now, let me tell you, as someone who comes from a VERY proud Irish family, I immediately gave my husband a funny face when he told me the ingredients. I mean, we had JUST been to Ireland (where, trust me, they definitely know how to make a rockingly delicious stew that is ACTUALLY a stew) – and this isn’t some well known dish or anything. 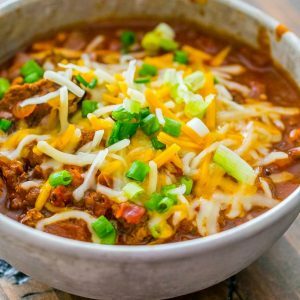 It’s also indicative of what many Americans think Irish food is, versus the type of food you will actually find in Ireland (which is full of bright, fresh flavor and SERIOUSLY delicious) but it is simple, quick, and totally crave-able. I’m pretty sure calling this dish Irish Stew is the moniker his family, from a small town in rural Kansas, came up with- maybe passed down from an Irish friend or relative and just became their interpretation of a traditional Irish Stew? Besides the fact this isn’t some well known Irish recipe, it isn’t even STEW. It is more accurately a hearty pasta salad – but the quirky title totally fits something Grandpa Ken would love. 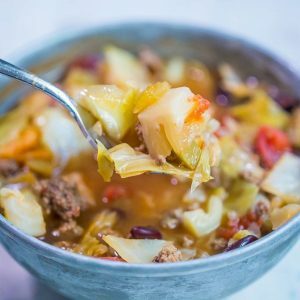 Is there anything better than hearty, delicious dinners that can be made in one pot and lightening fast? So after we made my husband’s Grandpa’s dish, I asked what we should call it. 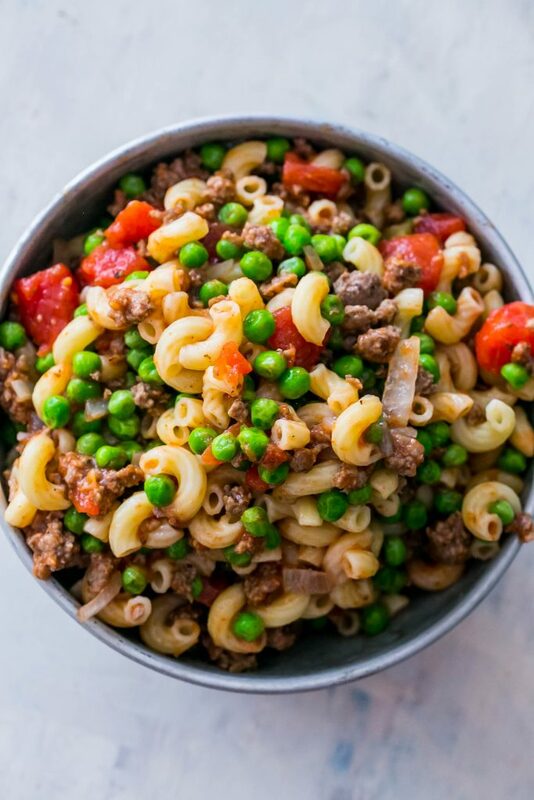 I considered “Beefy Macaroni Pasta Salad” – since that is technically what it is, but it just didn’t seem as good a tribute to Grandpa Ken – whose funny quips and stories would make you instantly happy and at ease. We miss him a ton since he died 3 years ago (we moved into the house he built last year, and are reminded of him everyday) but I love being able to remember one of my husband’s favorite people on earth through his fun stories and recipes he loved to eat. We hope you love this recipe, too! This easy hamburger pasta salad is so great because it can be cooked separately, and mixed together for a delicious dinner that is portable and perfect for picnics, cookouts, and more! 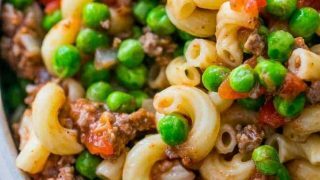 There are a couple tips to make a perfect Macaroni Irish Stew that will help you get a perfect hearty hamburger pasta salad every time! 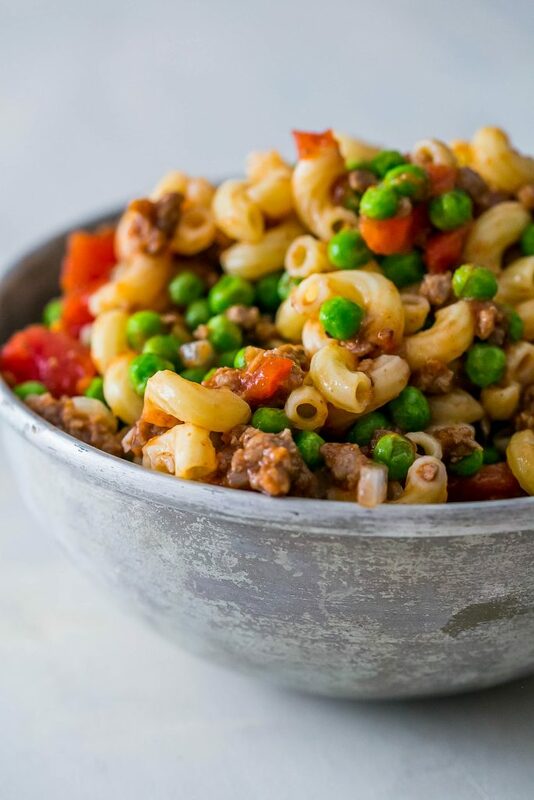 If you’re making this macaroni goulash for a picnic or potluck, cook the hamburger and combine with the tomatoes and then the peas to create the “sauce”; and cook the macaroni separately. When you get to your picnic or dinner, mix them together to prevent your pasta from turning to mush. For more robust flavor, simmer your meat in the tomatoes and spices. 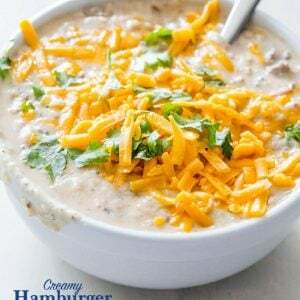 While not necessary (this recipe is created to be a mix all the ingredients together and stir to mix style recipe), for a deeper, richer flavor, stew the tomatoes, herbs, and spices with the hamburger meat when it has just cooked to infuse more flavor into the dish. Add 1 cup beef stock to the hamburger, herbs, and tomatoes and cook until liquid is reduced before adding to the macaroni. Cook your macaroni to al dente. Since this pasta salad is a hearty dish that does have additional liquid in the dish thanks to tomatoes, it is important to cook your pasta a little under done, so it doesn’t turn to mush when mixed with the rest of the dish. Cooking the macaroni to al dente, so it still has a bit of bite to it, will help your macaroni goulash have a perfect texture. 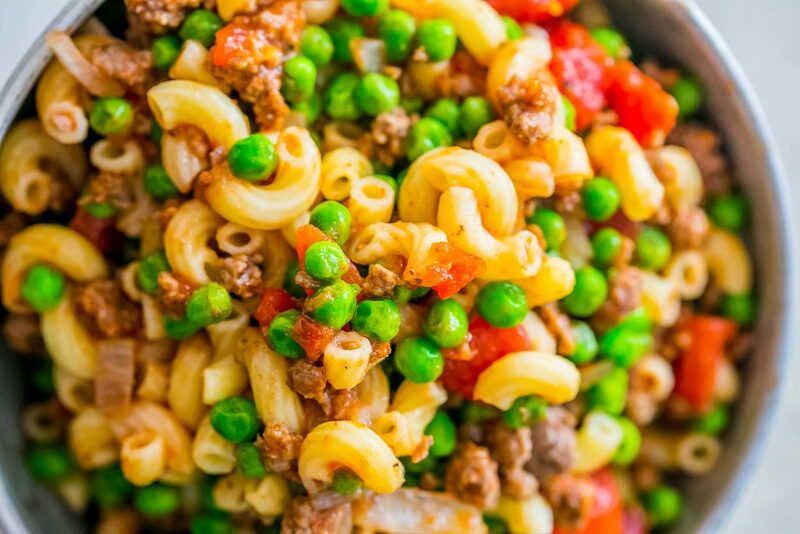 If you are making a big batch of this dish and want to freeze it, I personally suggest not adding in all the macaroni and only freezing the meat and sauce – but if you have leftovers, never fear! With these tips you can easily freeze and reheat this easy macaroni pasta salad. Put Irish stew in a ziploc bag or a vacuum seal bag – don’t overstuff. You want the bag to be able to sit flat in your freezer so it freezes evenly – less equals more in this case! Remove as much air as possible from the bag – this will help you prevent the formation of ice crystals, which will turn your meal to mush! Defrost naturally in the refrigerator OR throw the pasta in a hot pan with a little olive oil to reheat. 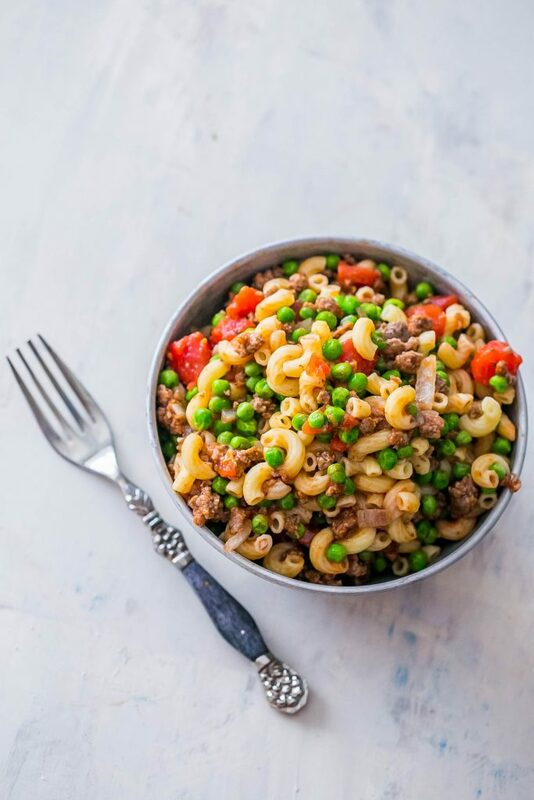 If you love this easy and delicious beefy hamburger macaroni goulash, be sure to check out some of my other favorite hamburger recipes – simply click to visit each easy printable recipe! 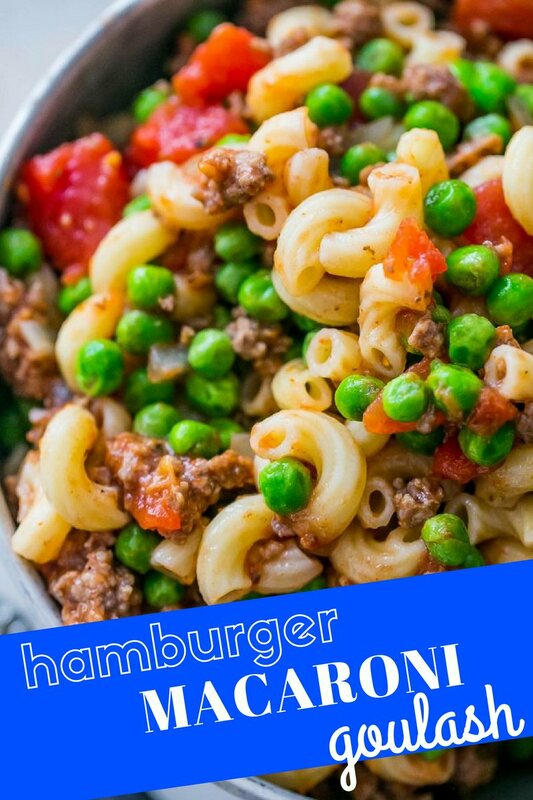 If you love this Hamburger Macaroni Goulash Recipe as much as I do, please write a five star review, and be sure to help me share on facebook and pinterest! 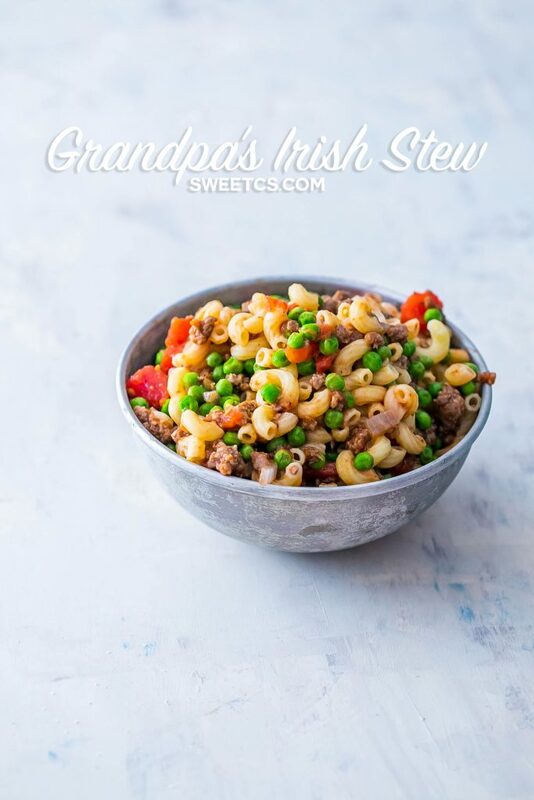 Grandpa's Irish Stew is full of meaty tomato and pasta flavor with peas and onions for a quick and easy hearty dish! On a large pot, over medium high heat, begin to brown ground beef. When beef is only lightly pink, add diced onion to pot and cook until beef is browned and onion is soft. Turn heat to low, and mix in all other ingredients. If using frozen peas, let cook on low until they are warm. Serve immediately or let cool and enjoy! So funny, in our family this was called”goulash”! We never added peas but it sounds like a great addition and i’ll Try it next time. Hi! My family has made this going back years to my great great grandmother. It’s “American Chop Suey”. It’s a completely American invention (out of necessity), not Irish at all, and It’s very common here in New England (especially so in MA, RI, NY). It came about in the early 1900’s during the heavy influx of Italian immigration to New England. Boxed pastas and canned tomatoes were being imported here from Italy during that time for the new Italian-Americans. Those items then began being produced here in the states and sold inexpensively, becoming a major staple of pre-war, ww1, depression, and ww2 era household pantries here. The meal was brought about by poor Italian and European immigrants mixing the new inexpensive, shelf stable pasta and canned tomatoes in with whatever scraps of cheap ground meat they had or could barter for to make that meat go further (beef, chicken, turkey, pork, or homemade sausage). In my area, we have a heavy population of Italian, Irish, Portuguese, and European families descended from that migration, and those populations took on the meal as well, making it their own by adding their preferred flavors or garden veggies they grew. Later, during WW2, some added cheap canned veggies, government supplies, or whatever meat rations they had to the mix — some of my friends’ families still add the peas, or cabbage, or ground portuguese chourico, or ground german sausage, and almost everyone adds onions. One friend’s family adds cream, worcestershire sauce, peas, onions, and mushrooms, and no one knows who started doing that lol. 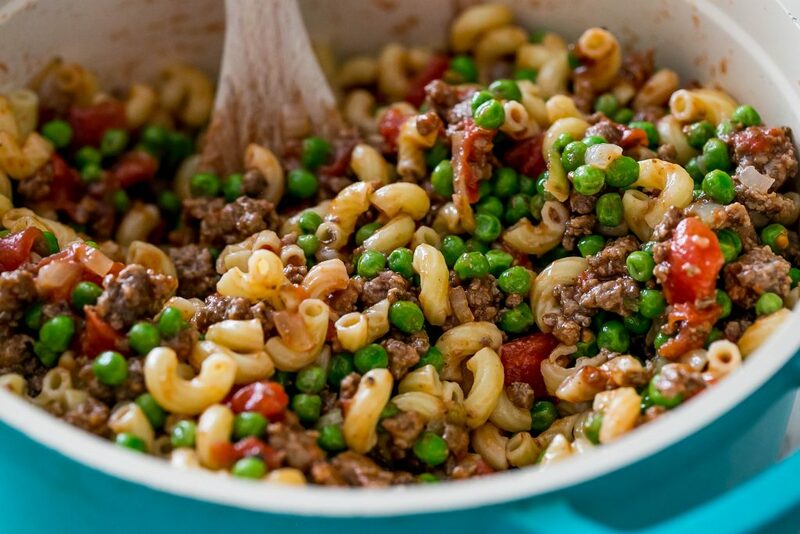 It’s most commonly called “American Chop Suey” here… but some restaurants/families/school cafeterias would add on “Irish style” or “Irish-American Chop Suey” to note that peas and bacon were added (the peas being green, making it “Irish” lol) or “Polish” when cabbage is added, etc. It spread throughout the country as immigrants started moving away from New England, and also after becoming a regular meal served to the military during the wars. My friend’s Boston-born gramma now lives in Chicago in a heavily Eastern European neighborhood, and they call it “American Goulash” because they add red peppers and paprika. Fun family story! Looks like a great recipe too! I love family recipes and the history here! I love those great dishes passed down through the years! Thanks Grandpa Ken! What a cute story, and a great looking pasta dish!